St Gerard’s School are Top of the Bench! Dr Mike Beckett, Head of Chemistry at Bangor University with the winning team from St Gerard’s School: (left-right) Jacob Alexandrou. 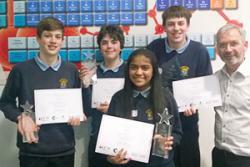 Matthew Willis, Shenona Mitta, Andreas Alexandrou.A team from St Gerard’s School in Bangor won this year’s North Wales heat of the Top of the Bench competition hosted by Bangor University’s School of Chemistry. The National Competition for 14-16 year olds is run by the Royal Society of Chemistry, and heats are held all over the country. St Gerard’s beat nine other teams to win the opportunity to visit Loughborough University’s Chemistry Department for the Final, which will be held on the 29th April 2017. Techniquest Wrexham were new partners for this year and enabled schools from further afield than ever before to take part. This was done by using Skype sessions for the introduction and finale – whilst the quiz was run in parallel at both sites. Bangor hosted 8 teams and Techniquest had two teams in Wrexham. For more information on all chemistry schools events at Bangor University please see the schools section of the Chemistry web site.